For one reason and several it was nearly 6 pm by the time I headed to the allotment yesterday. It had been a perfect day, an almost summer day, and I was sorry I’d not gone gardening sooner. There were, after all, the first early spuds and onion sets to plant, and parsnips and peas to sow, and several other jobs to be done. When I did finally get myself there, the sunset was so brilliant, I took to snapping scenes like this instead of doing what I’d meant to do. 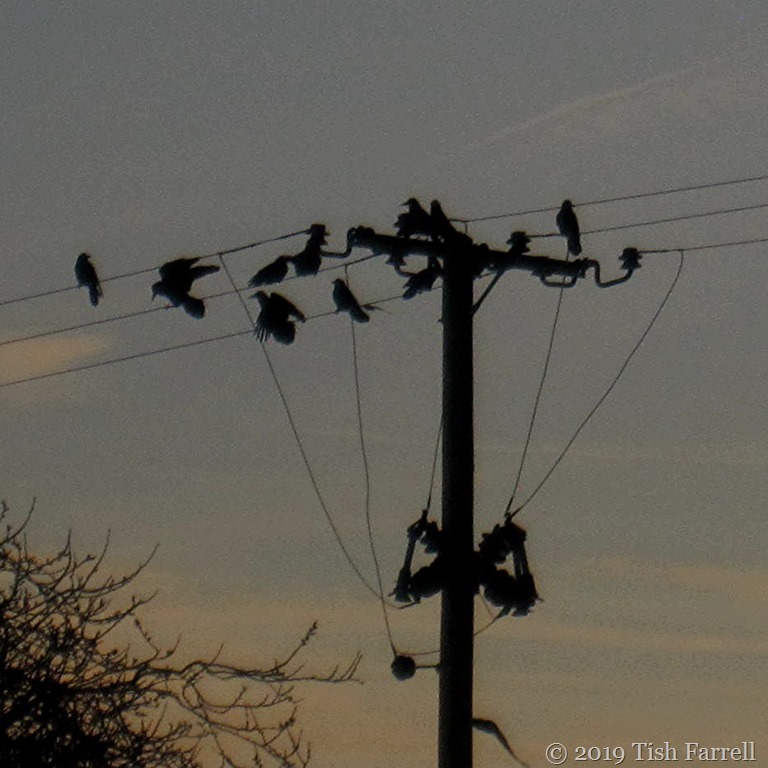 The rooks watched me from their gathering points on the powerlines, and even let me take their photo. Otherwise, I had the allotment entirely to myself, and there was that deep sense of the plots settling down for the night, free of their gardeners’ interventions. A moon in the pink, and the rooks flying over it. And I thought it probably was time to go home. And so a few photos later, I set off across the darkening plots, scrambled through the gap in field hedge into Townsend Meadow, again beheld the moon in picture book mode, this time over the Priory ruins, and thought how good it was to be alive, and that this was my first ‘home from the plot by moonlight’ of 2019. 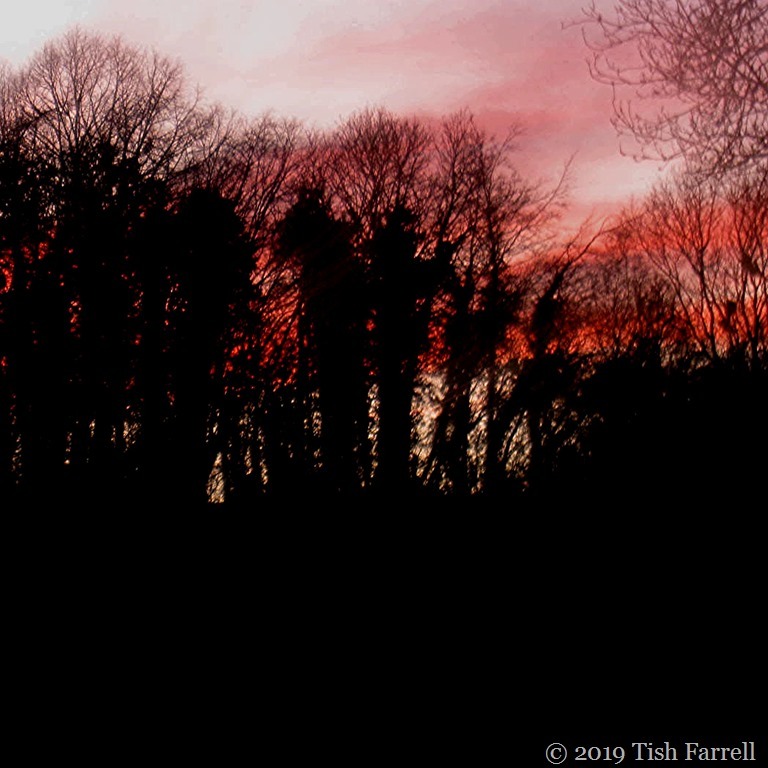 Posted on March 21, 2019 by Tish Farrell	This entry was posted in gardening and tagged #SpikySquares, alloment, Much Wenlock, Tish Farrell Writer. Bookmark the permalink. A gardener with a ready camera—I like it. Nice snaps. What a lovely moon shot. Too cloudy and misty for us to see it last night. It put in its best show here last night. Though it was astonishing to see it floating in candyfloss clouds in one direction, and the sunset in the wood in the other. I was watching the same full moon last night. It was so bright it almost could have been daylight. oh my you are dedicated to the allotment and to the camera. Most impressive. Garry came out in the middle of the night to point out that we had a full moon. Of course, I had to take a few pictures. He didn’t realize it was hazy and lightly drizzling outside. I took some interesting pictures. but this lens isn’t good for night shooting. Not fast enough. I hoped it would be clearer tonight and I could use a different camera and a faster lens, but it’s grayer today and likely to be raining tonight. This is the full moon of worms, I suppose because it is the dawning of spring. Mostly, it’s cold, muddy, and wet. I love your big crows huddling around you like the shadows of former lives. they are birds of shadow. Birds of shadow – I love that description. We have clouds too, so no second shots here either. But at least we the temp feels more like spring, and less wet. It must’ve looked amazing over the marshes. It sounds so peaceful there in the twilight as you go about your tasks. What a gorgeous moon shot and I love your ‘wood’s on fire ‘ image. You put your finger on it, Sylvia. ‘Peaceful’. It’s the peacefulness that one feels gathering there as the light fades. It’s no wonder you were distracted, such a wonderful time of the evening, especially with the amazing sky & busy Rooks! A stunning start to Spring, we were so lucky, definitely worth capturing a little of it! You are right, Pauline. One needs to treasure them too. Delicious distraction. The first shot in particular is stunning. Wow – a full moon in a pink sky! Beautiful! 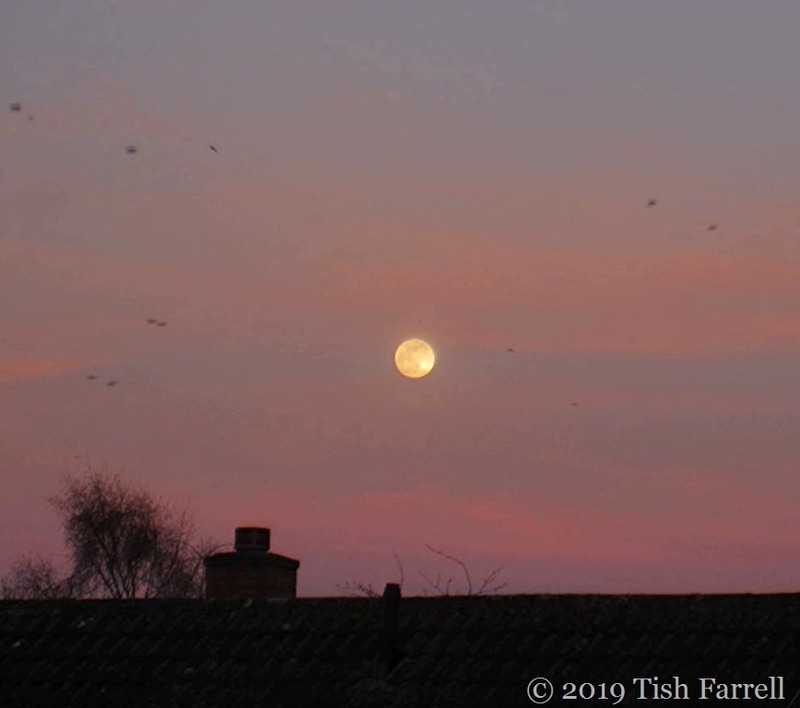 Oh…such a beautiful moment Tish with the moon in pink, positively bewitching! Bewitching – that’s the word, Athena. Thanks for restoring it to my rusty vocab. 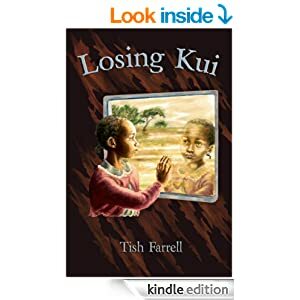 Great work Tish. Dramatic photos. Thank you for sharing your work.